From Canada's vast and rugged Northwest to Africa's emerging nations, life's adventure continues to unfold for the Editor Publisher of Africa Travel and Air Highways Magazines. Born in Dawson City, the Klondike Gold Rush Capital, Jerry Bird's wilderness adventures started early in life. In winter, dog teams, horse drawn sleighs, snowshoes, parkas and mukluks were part of the everyday scene, while ice floes on the Yukon River, flame-red fireweed and a brilliant midnight sun marked the changing seasons. Treks by pack horse, as part of a Canadian Government Topographical Survey, scaling yet unnamed mountains, flights by float plane to remote lakes, plus two consecutive seasons as a crew member on the SS Keno, (below) set the stage for far-flung adventures to come. The Steamer Keno was the last of a proud fleet of sparkling white Yukon River paddle-wheelers.Trimmed in gingerbread, with a tall yellow smokestack and bright orange paddle wheel, is now a museum in Dawson City. Cruising along the misty fjords of the Alaska Panhandle and Inside Passage, from Skagway, Alaska to Vancouver, BC and back, whet Jerry's appetite for waterborne adventures. .
Klondike Days: Travel on the narrow-gauge 200 White Pass & Yukon Railway, along the shoulders of Alaska's Sawtooth Range and Trail of '98, plus journeys on Canada's two great transcontinental routes, fueled his interest in rail travel (See Adventure Rails). Flying with Pat Callison and other bush pilots, plus service in the Royal Canadian Air Force, sharpened his interest in aviation. 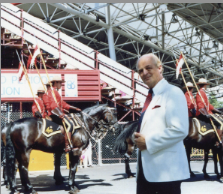 Jerry's father, Don Bird of Seattle, was stationed with the Royal Canadian Mounted Police in the Yukon Territory. His mother Violet was from Vancouver. Dawson city was like a time-capsule; a living museum from the Mark Twain era, with relics of Gold Rush Days on every corner. Monster gold dredges still operated on Bonanza, Eldorado and other creeks. Arctic grayling and salmon teemed in the rivers, lakes and tailing ponds - and every growing boy soon learned to cope with nature. Many of Jerry's school friends were of native heritage, which added another dimension - an attitude of tolerance. 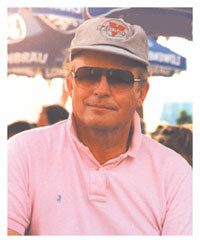 The World of Media: Jerry W. Bird's media career was launched at The Edmonton Journal, a major daily newspaper. His public speaking efforts began in Calgary, with Toastmasters International, and continued with association work and broadcast media. The creative process, using all aspects of communications technology excites him. Desktop and web publishing opened up huge avenues as a self publisher and broadcaster. Jerry has been equally inspired by many other developments along the way, from color lithography to award-winning audio visual productions. This combination of experiences became the pathway to his launch of Air Highways Magazine in 1995, with support from Transport Canada's Regional Director and 30 airport managers. A dual citizen (Canada-USA), Jerry partnered with the Africa Travel Association in 1995 to launch Africa Travel Magazine, whose reach is world wide thanks to its distribution via many African host countries and a 4,000 page web site. The ATA site generates over one million hits monthly and is #1 on Google and Yahoo for many Africa searches. To promote the magazines, he has organized a series of travel industry events in Vancouver, where he is President of ATA Canada Chapter. Mr. Bird was keynote speaker on "Tourism" at the Trans Canada Yellowhead Highway Association's 56th Annual Convention in Edmonton, Alberta. His experience with governments includes all levels. He has worked with and produced training and marketing films for many organizations, such as the Propane Gas Association of Canada which won a Creative Excellence Award at the U.S. Industrial Film Festival. Others include the Canadian Petroleum Association, Canada's Manufactured Housing industry, Certified General Accountants' Association of Canada, RV Manufacturers, Shrine-Lions Sweepstakes, Alberta's Electrical Power Companies Group, Alberta Potato Growers, Hotel and Travel Industry associations, and the Housing and Urban Development Association (Homexpo). His first environmental projects dealt with "Oil Spill Recovery and Cleanup" for the Canadian Petroleum Association and Imperial Oil (Esso) and programs for Alberta's Electrical Power Companies. The Government of Canada hired Jerry to produce several features, including "Alaska Highway- The First 50 Years. " Articles and features by Mr. Bird have appeared in national and regional magazines and newspapers, while his video and audio visual titles currently number close to 100. Mr. Bird's client list includes: Alaska Highway 50th Anniversary, Alberta Treasury Branches, Holiday Inns, Avis Rent A Car, Best Western International, Burns Foods Group, Calgary Brewing, Calgary Exhibition & Stampede, Carma Developers, Cargill Inc, CGA-Canada, City of Calgary, City of Edmonton, City of Saskatoon, Dupont Chemicals, Eli Lily & Co, Family Life Insurance Group, Government of Alberta, Government of Canada, Gulf Oil Canada, Imperial Oil (Esso), May & Baker, P. Lawson Travel, Purity 99 Gasoline, Quadrant Developers, Sheraton Hotels, Sunny Boy Cereal, Travel Alberta, Travelodge and University of Calgary. In addition to the above, he has handled numerous retail marketing projects. "With the escalating cost of paper, a valuable forest resource, publishers should expand their reach and serve more readers per copy. A good magazine is a keeper, with an extended life span, like National Geographic which never seems to go out of date. On the Internet, the real challenge is to cut through the clutter and bombardment of asinine sales pitches and empty promises."